Chief Outsider Endorses "Purpose Driven Procrastination"
Sometimes it is better to procrastinate, but it needs to be on purpose. As the CEO of a new start-up company I had many daily challenges that needed my attention. Some I would handle right away, some I would put off. I needed to focus like a laser on the critical path issues which supported revenue generation and procrastinate on activities that were important but not critical. Planning is not something you can procrastinate. "In preparing for battle I have always found that plans are useless, but planning is indispensable." Dwight D. Eisenhower (1890-1969) Thirty-fourth President of the USA. The first thing I did when I started the company was to create and prioritize the business plan. I then made sure there was a dashboard created to keep track of the progress on the critical path activities. The plan was a living plan. I needed to be able to move quickly and focus on the things that would generate revenue and profitability. The web site was important, but our sales method required hands-on technical presentations, training and nurturing. Recruiting trained professionals to sell and support the customer was the top priority, not the website. Marketing, operations, non-essential finance, regulatory and legal issues were important, but most could be triaged and backfilled. Focus on the critical, delegate the rest. I did not have a stapler or Post It note when I started the company. But I did not want to spend time getting them so I called my wife and invited her to visit the new office which was a 500 square foot space, subleased from an accounting firm located three doors down from the New York Sstock Exchange. I told her that if she would bring me some office supplies, I would take her out to dinner. She had worked many years as an executive assistant to large company chairmen so I knew she would be better at getting the supplies I needed than I would ever be. Revenue is king, operations can be procrastinated on purpose then backfilled. We could not process an order, keep track of inventory, or track a shipment but we started getting revenue almost immediately, within days of starting the company. We did not want to procrastinate on revenue. So how did we do it? There is a term I use that many successful CEOs will recognize. The term is backfilling. We fixed things on the fly. Recruit, hire, delegate, trust and mentor. I hired a finance person with operations know-how. We hired an administrative assistant who was willing to learn and to stay after hours until the important must-do items were done. I hired 4 sales professionals to recruit and train independent sales consultants. We set our daily priorities and juggled the list based on the most pressing issues to support revenue generation. 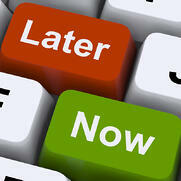 We procrastinated on many activities on purpose till we took care of the most pressing needs. I stopped the cash burn in less than 10 months after start-up, because I had established a dependable revenue stream. We went from a revenue run rate of zero dollars to a 9 million dollar run rate in just 18 months. We could breathe, but we had a lot of back filling to do to support even faster growth. We began to procrastinate on the new customer side until we had the back of the house in order. We needed a much larger, more convenient, easily accessible location. We relocated, improved operations and focused like a laser on revenue. The company is still doing great today. It survived the down turn and is viable for the long term. Laugh at and learn from the screw-ups. The CEO of a start-up needs to be focused on the must-do activities. When things go wrong (and they will) laugh at them, fix them and learn from them. Focus like a laser on the most important things that need to be done and have fun doing them. Surround yourself with trusted, enthusiastic team members who want to learn. Reward them for their success, pick them up and teach them when they fail. Replace them quickly if they are unwilling to grow. Do the must-do activities first. Procrastinate the have to do and would like to do activities, then backfill once the must do activities are accomplished. Plan your procrastination.